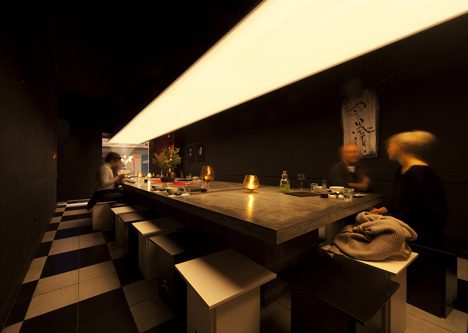 Architects Facet Studio continues to storm through the design industry with this new and -rather in-keeping with their previous renovations – intriguing design for a Japanese restaurant in Sydney. 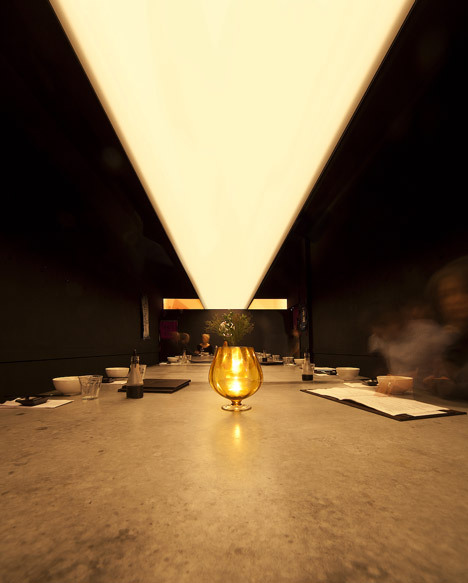 As shown below, a continuous band of lighting shines down onto a long concrete table – which seats twenty-four people comfortably in the dining area of the Uchi Lounge. The dark walls and ceiling really emphasises the thirteen metre length lighting fixture which spans the entire room. The floor follows a similar colour scheme with a black and white chequerboard tiles. I think all aspects of this space helps to create a relaxed atmosphere in which the public can come and enjoy some of the world’s greatest cuisine in the heart of Sydney, Australia. The design and floor plan of this restaurant (shown below) really outlines the simplicity of design and how this can really favour the architects and designers behind such creations. This entry was posted in Commercial, Interiors and tagged Architects, Architecture, Contemporary Design, Design, Dezeen.com, Facet Studio, Inspiration, Inspirational, Interior Architecture, Interior Design, Interiors, Modern, Modern Design, New Finds, Opinions.